Memorial Stadium was the first college stadium to utilize instant replay video boards and, in 2006, added a 117-foot by 33-foot Mitsubishi video screen as part of its North Stadium Expansion. 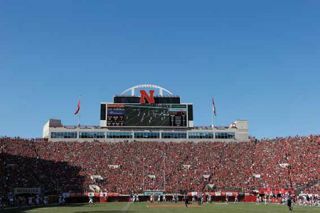 In 2009, two additional 24-foot by 21-foot video screens were added in the stadium corners along with ribbon screens along the east and west stadium balconies. LINCOLN, NE—Football is a passion in Nebraska, and Husker fans are among the most loyal of any college team. But, despite an NCAA record 333 consecutive sellouts, the University of Nebraska doesn’t take its fan loyalty for granted. So, this year, as the Huskers kick off their 125th football season, fans will be treated to the results of a recently-completed $12 million Memorial Stadium “Fan Experience Improvement Project” including a new sound system, new and upgraded private suites with multi-channel video, stadium-wide Wi-Fi and a new smartphone app with exclusive content for stadium fans. The technology behind all of this will be largely invisible to the fans, but it is impressive in its diversity, scope, and in the design and integration efforts that brought it all to life. All of Memorial Stadium’s systems communicate and cooperate over a modern fiber network managed by Cisco switches with virtual networks carved out for IP video and sound and for security and emergency notification. The stadium’s Cisco Stadium Vision system is the largest such collegiate installation in North America, carrying 48 channels of Direct TV, including multiple ESPN channels and the Big Ten Network, along with four channels of the university’s own “HuskerVision” broadcasts. Memorial Stadium was the first college stadium to utilize instant replay video boards and, in 2006, added a 117-foot by 33-foot Mitsubishi video screen as part of its North Stadium Expansion. In 2009, two additional 24-foot by 21-foot video screens were added in the stadium corners along with ribbon screens along the east and west stadium balconies. The three main screens have been updated to high-definition and all are now integrated into the stadium’s Fan Experience Project systems. Memorial Stadium’s 103 private suites have been upgraded with large-screen televisions. A QSC “Q-Sys” touch-screen control in each suite allows patrons to choose from any Stadium Vision feed for each TV screen and direct their choice of audio feeds, including a local iPod input, to the suite’s ceiling loudspeakers. When suite patrons choose one of the live HuskerVision feeds, a custom delay is applied to sync suite audio with the live audio from the stadium sound system. Memorial Stadium’s 103 private suites have been upgraded with large-screen televisions. A QSC “Q-Sys” touch-screen control in each suite allows patrons to choose from any Stadium Vision feed for each TV screen and direct their choice of audio feeds, including a local iPod input, to the suite’s ceiling loudspeakers. Because the stadium’s unique design made a distributed sound system impractical, its new sound system (see sidebar) is an end-zone style scoreboard system using Meyer Sound self-powered line array loudspeakers supplemented by Meyer Sound Beam loudspeakers and point source loudspeakers. The system provides uniformly high-quality, high-level sound throughout the stadium, even in the South Stadium seating that’s more than 800 feet from the scoreboard. Fans will be able to install a free “Husker App” that will provide live action video from several camera angles, on-demand replays, player bios and stats, and “location services” like directions to concessions or restrooms. Wi-Fi to support the app for the stadium’s 90,000 fans has undergone a massive upgrade with antennas located throughout the seating areas and suites in places like dropped ceilings and non-metallic handrails. Cellular phone service has also been upgraded by several providers with antennas located in the end-zone video scoreboard or distributed throughout the stadium. All of these systems work together in an amazing and seamless coordination to provide what has become the new standard for fan experience in modern sporting facilities. Credit for this performance goes to the university itself, which spent years researching and planning the upgrades, the designers, including consultants WJHW , the programmers such as K2 Audio, and the systems integrators including Electronic Contracting, Downs Electric, Alpha Video, CDW, and DSS. Chris Foreman (chris@proaudioweb.com) is a career audio professional, educator, and writer. Co-author of the Handbook for Sound Engineers edited by Glen Ballou and Audio Engineering for Sound Reinforcement with consultant John Eargle, Foreman offers marketing, publicity, and management consulting through his company Wordworks. Originally constructed in 1923, Nebraska’s Memorial Stadium has undergone several major expansions resulting in a modern facility that serves 90,000 Husker fans. For the most recent East Stadium expansion, the Nebraska Athletic Department chose to replace a 20-year-old central cluster with a new sound system. After hearing a Meyer line array system at the University of Michigan’s “Big House” stadium, UNL chose this design concept as offered by Mark Graham of WJHW. They rejected a distributed system, which would have required costly structural additions to the stadium. Memorial Stadium’s new setup consists of four Meyer line arrays. Meyer point-source loudspeakers and smaller EAW loudspeakers cover the near-throw areas beneath the cluster. Existing Community and other loudspeakers were retained for under-balcony coverage and concourses. The Meyer line-array loudspeakers are self-powered; passive loudspeakers are powered by QSC amplifiers in racks distributed throughout the stadium. The entire system is managed by a QSC Q-Sys system, which controls much of the entire stadium media network and provides feeds to HuskerVision and smartphones through the Husker App. Nebraska Athletic Department personnel can configure the system for different events from a large touch-screen controller in the West Stadium announce room. Suite patrons have three-inch Q-Sys touch screens that allow them to select any of 48 Direct TV feeds or the four HuskerVision feeds, and to control sound source and level. Live play-by-play Husker theme songs and half-time programs are mixed through a Yamaha LS-9 mixer in the announce room. When needed, the entire stadium sound system becomes part of the emergency announcement system through switch closures. The system is backed up with UPS and generators and a redundant Q-Sys mainframe for this purpose.